From the first time you clap eyes on it, one thing is apparent: Mitsubishi’s entry in the compact sedan marketplace is probably the best looking. It’s hard to believe it’s descended from the same ghastly contraption that arrived on our shores way back in 1977. Now in its ninth iteration, the Mitsubishi Lancer first debuted way back in 1973 as a diminutive sports coupe along the same lines as Toyota’s eminently more attractive Celica. Called everything from the Celeste to the Valiant to the Colt, it took decades to truly take hold as a viable alternative to its competitors, and didn’t really earn much of a reputation in North America until 2000, when Mitsubishi launched the previous generation of Lancer. However, like Nissan’s GTR, the Lancer’s 21st –century fame came not from an overzealous marketing campaign or an abundance of positive customer reaction, but rather from its pixelated popularity in video games like Gran Turismo and Need for Speed. Doing their duties as halo cars, the Lancer-based Evolution 8, Evolution 9, and now Evolution X have been the preferred virtual steeds of too many armchair racers to count, and have transferred that virtual reputation into a very real street-born respect through a healthy investment in motorsport. And you better believe Mitsubishi is banking on that reputation. 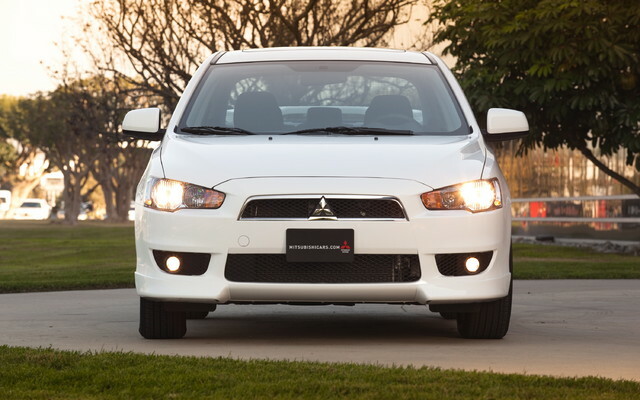 One glance at the standard-issue Lancer demonstrates exactly how much ties this car to the Evolution that’s now just barely based upon it. There’s the same bullish nose (albeit body coloured), and same stance-widening side skirts, and a low, ground-hugging front air dam. Although it may not have its visual cues cranked up to 11 like the Evolution, the Lancer is still vastly more attractive than the snub-nosed Civics and mini-Camrys patrolling the roads, and there’s definitely no shortage of visual improvements available on the aftermarket. Paint quality is good, and there’s a uniformity of panel gaps that belie high-quality assembly. I was unable to find any unpainted sections of bodywork (a phenomenon that is surprisingly common) and the finishing of high-wear areas is excellent, supporting the brand’s longstanding warranty period. Underneath, the Lancer shares plenty of basic architecture with its fire-breathing cousin, albeit again in a dialled-down concentration. Although shared with the Dodge Caliber and Jeep Compass, the front-wheel drive platform was refitted with suspension bushings and components meeting Mitsubishi’s more performance-oriented standards, and the benefit is obvious. Obviously, the upper GTS and Ralliart models are substantially more sporting, but even the SE model tested was sufficiently capable. Providing a ride that favoured comfort over capability, the SE felt hampered by soft springs and tall tires, inspiring little confidence in the vehicle’s ability to react quickly. Given a chance though, it responds to slower inputs with a gradual progression towards very mild understeer, supplying surprising levels of grip before finally giving up adhesion. The steering remains relatively mute during the majority of the driver’s exploits, but maintains its line and requires only subtle corrections over irregularities. And then there’s the powertrain. Although producing a relatively mild 152 horsepower, the 2.0 litre four cylinder possesses the Jeckyl/Hyde personality that seems to accompany most variable valve timing-equipped motors. Putter about town, and it’s a smooth, quiet four pot providing plenty of oomph for inner city commuting, but push the tachometer above 4,250 rpm and you’re rewarded with 146 pound-feet of torque and a snappy surge of power for dispatching those slow-moving Kenworths and Freightliners. Hold on to 6,000 rpm, and you’ll be surprised to find a powerband that’s Kansas-flat between the peak torque and peak horsepower figures, giving the car a predictable, steady accelerative property that makes corner exits easy to nail. But sadly, it’s not quite perfect, because inside that attractive, entertaining wrapper is an interior that would look more at home in something from 2002. Simply put, there’s an overabundance of low-grade black plastic that’s both scratch and static prone. In other words, it always looks worse for wear. Likewise, the door panels are downright bland, and the gauge binnacle looks like it was just a wee bit of an afterthought. On the upshot, it all works fantastically. The standard five-speed shifts beautifully and falls easily to hand, and although the seating position isn’t perfect for me (shorter legs and longer arms would be a boon), it’s not far off. The gauges themselves, although being somewhat plain, encapsulate a fantastic multi-information display that shows all the standard fuel and trip computers, as well as how long you have until your next upcoming maintenance in both kilometres and months. Finally, there are plenty of practical spaces within the Lancer’s cabin, with big door pockets, good cupholders, a nice center console bin and plenty of other nooks and crannies to store your stuff. Also, it’s worth noting that even the relatively spartan SE came equipped with Bluetooth; a real strength now that cell-phone bans are becoming more popular every day. At the end of the day, there’s not much to argue with when it comes to Mitsubishi’s best-known car. Is it perfect? No, but with a sticker price that starts at just over $15K, you’d be crazy to expect perfection. If it’s got a single knock against it, it’s that the interior doesn’t quite to the rest of the car justice, and no amount of model-jumping from DE to SE to GTS is going to change that. Of course, it’s important to keep in mind that Honda’s Civic and Toyota’s Corolla are hardly bastions of luxury, and although the Lancer may be slightly less so than its biggest competitors, it more than makes up for its singular shortcoming with an excess of attractiveness and entertaining characteristics.